A Monk finds Cyrano and Christian standing outside Roxane’s house. The Monk tells the men he’s looking for the house of Roxane. Cyrano points the Monk toward a distant street, and the Monk thanks the men and moves on. In a moment of sudden comedic bathos (a shift from the sublime to the vulgar or absurd), the hapless Monk interrupts Cyrano and Christian’s elaborate seduction of Roxane. Arn, Jackson. "Cyrano De Bergerac Act 3, Scene 7." LitCharts. LitCharts LLC, 21 Mar 2016. Web. 20 Apr 2019. Arn, Jackson. "Cyrano De Bergerac Act 3, Scene 7." LitCharts LLC, March 21, 2016. 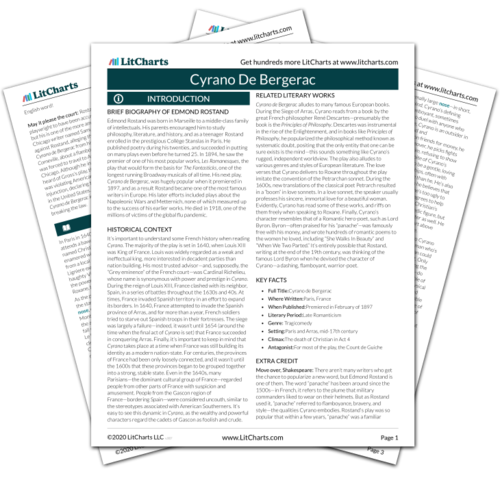 Retrieved April 20, 2019. https://www.litcharts.com/lit/cyrano-de-bergerac/act-3-scene-7.